The history of modern UFOlogy could be at a turning point. 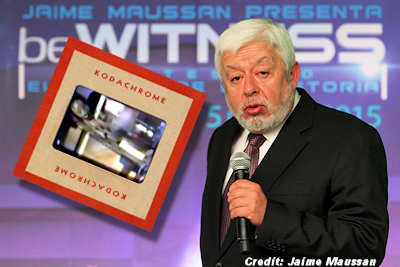 The next May 5 in Mexico City, during a meeting in the Auditorium National, the journalist journalist and Mexican ufologist Jaime Maussan will present slides showing the body of an extraterrestrial being supposedly recovered following the Roswell UFO, which took place in July 1947. . . . I reached via Skype Jaime Maussan, who has kindly granted me an interview, a few hours before his departure for Phoenix . . ..
Maurizio Baiata: Hola Jaime! Thanks to this Skype connection. I follow the unraveling of the case "Roswell Kodachrome Slides" from the beginning, a couple of years ago, but now we have the certainty and your ad twice before Tom Carey and then your, increases the expectation of May 5, when Mexico City you present your slides. I ask you a question bluntly: that circulating on Facebook is one of the slides in question? Jaime Maussan: Yes, but it is a poor quality copy of the original, which is rather sharp and you can notice many details. Maurizio Baiata: I expected the answer, because we know each other well and frankly I could never believe you, Tom Carey and Don Schmitt could have stumbled on an obvious fake, or you were making accomplices of a scam by imbeciles. Jaime Maussan: It is not a scam. . . . Isn't Jaime Maussan the same character who described balloons as "alien fleets"?.. This man has zero credibility with me... All of the alien UFO reports that I've seen coming out of Mexico are either obvious hoaxes or willful misinterpretations of unextraordinary events... All that said, I would love to see real believable evidence of aliens visiting Earth. I just haven't seen it yet.